From February to July, members of Prado Racing Team tore up the San Diego road racing circuit, with squad appearances at the following races: the Cardiff Kook 10K (February), Coronado Valentine's Day 10K (February), Carlsbad 5000 (March), Cinco de Mile Run (May), Navy Bay Bridge Run 4M (May), San Diego Rock 'n' Roll Half Marathon (June), and the Scripps Ranch Old Pros 10K (July). For the women's team, the spring season featured multiple club record performances. Elizabeth Ryan lowered the 10K club record on 3 separate occasions, starting with 35:02 at the Kook 10K, then 34:52 at Coronado a week later, and finally smashing the mark with a 34:14 at the Scripps Ranch 10K on July 4. In addition, she clocked the squad's first sub-17 minute 5K with a 16:54 on the track at the Oxy Invitational. Hilary Corno notched another club record (both masters and overall) in the half marathon at Rock 'n' Roll SD with a 1:15:42 clocking and also set a new masters standard of 34:58 in the 10K at Scripps Ranch. Finally, in her first race in the PRT kit, Fiana Kumm recorded the first sub 5 mile for the PRT women, running 4:59.33 at the final USATF-SD Summer Nights track meet. In addition, a number of club members turned in PR performances: Sofie Schunk ran a breakthrough 17:31 5K at Carlsbad, Angela Moll and Bridget Nolan set back-to-back PRs at RnR SD, and Kaitlin Hildebrand PR'd at the OC Half Marathon. Celestine Arambulo and Amy Halseth also turned in strong half marathons at RnR SD. On the men's side, highlights included a wild Carlsbad 5000 performance in which Ryan Place finished 4th in 15:11 after the lead men were stopped by a train. Tyler Underwood and Oliver Langford dueled at the Cinco de Mile Run, finishing in 2nd and 3rd, but both would go on to even more impressive races - a sub-20 clocking at the Bay Bridge Run and comfortable win at the Old Pros 10K for Tyler, and a 15:17 track 5K PR for Oliver. In the masters ranks, Brian Coullahan ran an impressive 2:47 Boston Marathon in historically difficult conditions. Jason Batterson took the masters win at the Cinco de Mile Run in 4:54. Finally, in his first season with the team, Jens Lykke-Anderson suited up for six of the team focus races as well as the Carlsbad and La Jolla Half Marathons. The most popular race was the Carlsbad 5000 with 26 PRT athletes (men and women) competing. Overall, the team made over 110 San Diego appearances. 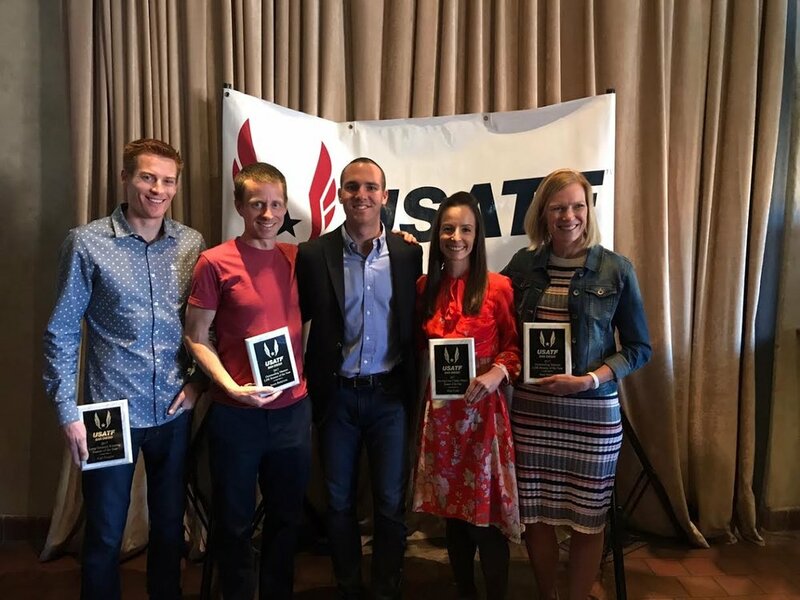 Several PRT members were recognized at the USATF San Diego annual awards banquet at Stone Brewing Company on February 25, 2018 for their excellence in running for the 2017 season. The PRT athletes receiving awards for the spring long distance running season were: Open Male Road Runner of the Year Carl Dargitz, Masters Male Road Runner of the Year Jason Batterson, and Masters Female Road Runner of the Year Amy Halseth. For the Dirt Dog Cross Country season, Hilary Corno was recognized as Masters Female Runner of the Year. Congrats to all! Left to right: Carl Dargitz, Jason Batterson, Men's Long Distance Running chair Nick Scarpello, Hilary Corno, and Amy Halseth pose with their awards. Between August and December, PRT athletes competed in the 8 races of the San Diego-Imperial USATF Dirt Dog Cross Country Series. Fall 2017 marked PRT's seventh season participating in the series, and it proved to be as competitive and fun as always! The season kicked off with the Wild Duck 5K in Oceanside, highlighted by individual wins for Hilary Corno (Women's 40+), Tyler Underwood (Men's Open), Jamaal Ryan (Men's 40+), and Matt Sheremeta (Men's 50+), along with an unofficial win for Elizabeth Ryan. In the next race, the challenging Balboa 4 Miler, Hilary (1st), Liz (3rd), Tyler (2nd), and Jamaal (2nd) repeated as PRT's top finishers in their respective divisions. Kevin Zimmer picked up the win in the Men's 50+ division, and Scott McEntee began his streak of PRT Men's 60+ finishes with a second place..
At the Bonita 8K, Nick Scarpello (Men's Open) and Matt Sheremeta (Men's 50+) were overall winners for PRT, with Elizabeth Ryan (3rd, Women's Open), Amy Halseth (4th, Women's 40+), and Jason Batterson (3rd) setting the paces in their categories. 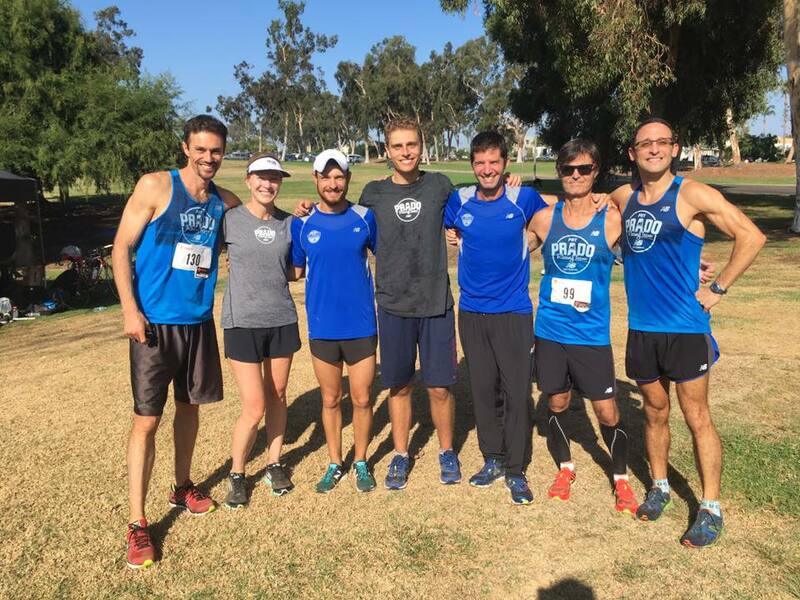 At the Crazy 8's 5K in Rancho Bernardo, Nick Scarpello, Hilary Corno, and Kevin Zimmer picked up additional wins, while Kaitlin Hildebrand (3rd, Women's Open) and Jamaal Ryan (2nd) also notched top team placements. At the Cougar Challenge at Cal State San Marcos, the PRT masters were victorious, with wins for Jamaal Ryan, Amy Halseth, and Kevin Zimmer. Dan Seidel (4th) led the way for the Open Men. Just a week later at the Ursula Rains Balboa Boogie 5K, the same quartet repeated as the team's top finishers. 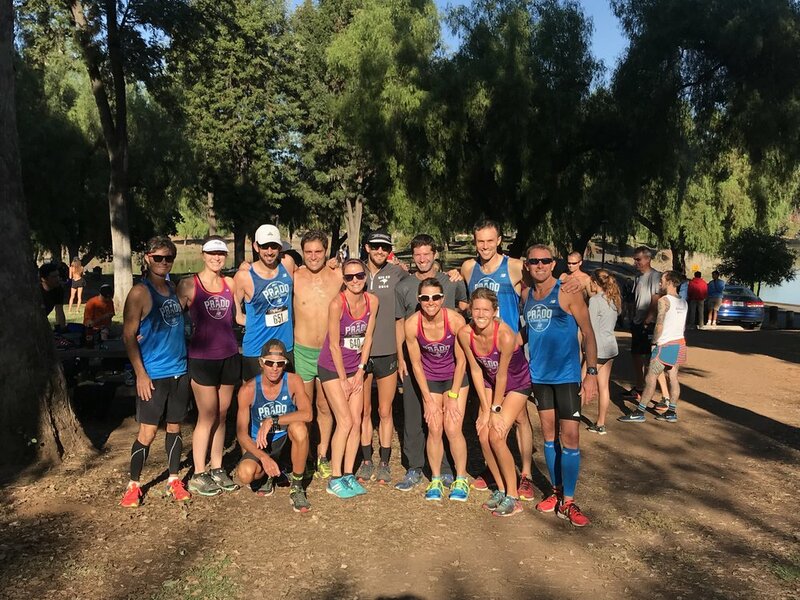 The team finished out the regular season at the Cuyamaca 6K, with repeat wins for Nick Scarpello, Jamaal Ryan, Amy Halseth, and Matt Sheremeta, and second place finishes for Kaitlin Hildebrand and Scott McEntee. While the Women's Open team had been depleted due to injury early on, going into the championship race, the Men's Open, Women's 40+, Men's 40+, and the perfect-scoring Men's 50+ team were all in position to contend for wins. PRT at the Cuyamaca 6K. Back row: Scott, Amy, Paul, Derrick, Tyler, Dan, Jamaal, Marc. Front row: Matt, Angela, Charisa, Kaitlin. In the Women's championship race, Elizabeth Ryan gamely took it out hard on the first lap with Boom Running's Paula Lamont. While Lamont pulled away, Ryan held on for a second place finish (fourth in the series scoring). Kaitlin Hildebrand took sixth place and with a strong regular season finished third in the series. Kristin Schleicher competed during the regular season. Running concurrently in the Women's Masters category, the team of Hilary Corno, Amy Halseth, and Charisa Wernick were able to bring home the 40+ team win, with the help of Angela Moll scoring in the regular season. Corno and Halseth finished 1-2 in the series scoring with Wernick in 6th. The men's championship race featured a battle between Daniel Gonia running unattached and Nick Scarpello and Tyler Underwood of PRT. Gonia prevailed, with Underwood moving up over the race into second and Scarpello third. In the series scoring, the order was reversed, with Scarpello 2nd, Underwood 3rd, and Dan Seidel taking 8th. The men finished second to the San Diego Track Club in the team division. Derek Bradley, Derrick Lloyd, Thomas Whitcomb, Chuck McKeown, Alex Phipps, Carl Dargitz, Ryan Place, Blake Wilson, Paul Wellman, Eduardo Mariscal, and Kevin Sorrell rounded out the Open Men's team during the 2017 Dirt Dog season. The Men's Masters 40+ team was led by Jamaal Ryan in second place behind Boom Running's Okwaro Raura, with Jason Batterson in third, which would equal their final standings in the series. The team finished second to Boom Running, with Michael Stange, Andrew Block, Brian Coullahan, Justin Runac, Brian Culley, and Joel Bernard donning the PRT jersey this season. To no one's surprise, the Men's Masters 50+ team won the team title with their eighth consecutive win of the season over the Bonita Road Runners. Kevin Zimmer was the race and series winner with Matt Sheremeta in second, Adam Weiner fourth, and Bruce Boettner 6th. Jeff Creighton and Marc Sosnowski also contributed team points. Scott McEntee was PRT's lone 60+ representative, but he made the most of it by finishing every race in fourth place or better, ending up 3rd in the championship and series scoring. The 50+ Men plan to compete at the USATF Club XC National Championship in Lexington, KY in December. In total, four PRT runners earned the IronDog distinction for completing every race in the series: Charisa Clarkson, Amy Halseth, Scott McEntee, and Daniel Seidel. According to form, PRT celebrated another fun and successful season with a team party, including a picnic at Liberty Station and a trip to Stone Brewing Company. The team is grateful for the opportunity to race in this competitive series every year! Throughout the Dirt Dog Series, the PRT’s Open Men found themselves battling the Jamul Toads, while the Masters Men were in tight competition with the San Diego Track Club. Over the course of seven races, each team earned the maximum possible points—60—leading into the championship race at Mission Bay. Some top performances on the Open team included victories by Nick Scarpello at the Wild Duck 5K, the Balboa 4-Miler, the Cougar Challenge, and the Cuyamaca 6K; second-place showings by Tyler Underwood at the Balboa 4-Miler, the Cougar Challenge, and the Cuyamaca 6K; and a second-place for Dan Seidel at the Ursula Rains Balboa Boogie 5K. On the Masters side, Stephen Johnson ran 17:03 to get a close second at the Wild Duck 5K; Patrick Burke grabbed second place at the Balboa 4-Miler (23:42); PRT impressively swept places 1-4 at the Ursula Rains Balboa Boogie 5K (Rob Verhees, Stephen Johnson, Patrick Burke, and Brian Culley); Kevin Zimmer took second at the Cougar Challenge 8K; and Brian Culley won the Cuyamaca 6K Masters race, with Jeff Creighton winning the 50-59 division. Heading into the Dirt Dog championships at Mission Bay, the Open Men were tied, 60-60, with the Jamul Toads, and the Masters held a 60-48 lead over the San Diego Track Club. In the Open race, Nick Scarpello took second place and led the men’s team, running 25:51, just ahead of new (though non-scoring) member Carl Dargitz. The remaining four scorers were Tyler Underwood (26:33), Alex Phipps (26:41), Dan Seidel (27:00), and Derek Bradley (27:10), who came up just short of the Jamul Toads and therefore took second place overall in the series. In the Masters race, Rob Verhees took second in 28:09, followed closely by Patrick Burke (3rd, 28:26), and Brian Culley (4th, 28:37). They led the 40-49 team to victory in the race and the series. In the 50-59 group, Kevin Zimmer won the championship race in 28:41, and along with Jeff Creighton (30:16) and Scott McEntee (32:51) took the team title as well. Individually, PRT had five Open men in the top ten overall for the Dirt Dog Series—Nick Scarpello (1st), Tyler Underwood (4th), Dan Seidel (6th), Iron Dog Alex Phipps (8th), and Derek Bradley (9th). In the Masters standings, five men also placed: Patrick Burke (2nd), Brian Culley (3rd), Rob Verhees (5th), Iron Dog Matt Sheremeta (7th), and Michael Hansen (8th). 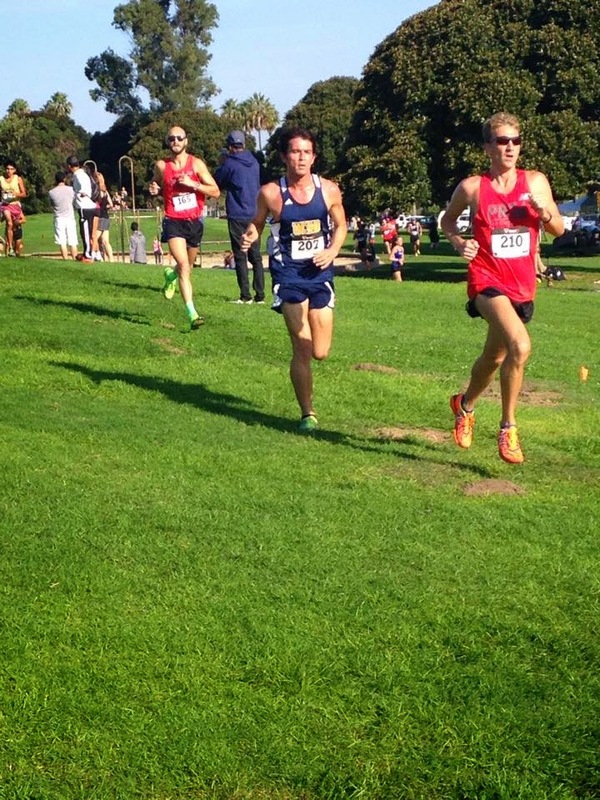 In December, PRT sent 18 men to compete at XC Club Nationals in San Francisco in Golden Gate Park—seven in the Open race, and 11 in the Masters race. In the Open race, Nick Scarpello finished 50th in an incredibly deep field, setting a hard early pace and battling through to a PR in the 10K (including roads!) of 30:53. He was followed by Dan Seidel (32:44), Derek Bradley (33:06), Alex Phipps (33:18), Paul Wellman (34:36), Andy Corman (35:13), and Kevin Sorrell (37:14), and the PRT Open men were able to defeat the Jamul Toads squad who’d narrowly beaten them the previous month at the Dirt Dog XC Championships at Mission Bay. Overall, the Open team placed 32nd out of 59 teams, a significant improvement from their previous appearance at the 2013 XC Club Nationals in Bend, Oregon. In the Masters race, Robert Verhees turned in the best individual performance, winning third place nationally in the 50-59 age group! (34:22). He led the 50-59 San Diego team, which also featured PRT members Kevin Zimmer (35:37), Jeff Creighton (37:21), Gerard Reski (40:10), and Scott McEntee (40:36), to a sixth-place finish out of 18 total teams. The 40-49 squad, led by Brian Culley (35:13) and also featuring Matt Sheremeta (36:18), Chris Hupfeld (37:38), Marc Sosnowksi (38:08), Joel Bernard (39:13), and Justin Renac (39:31), took 18th out of 28 teams. Based largely on their excellent cross-country performances (as well as earlier performances in the 2015 spring road series), Nick Scarpello (Open) and Rob Verhees (Masters) were each recognized as the 2015 USATF San Diego-Imperial Association Distance Runner of the Year. Congrats, guys! The women of Prado Racing Team had a successful Fall, highlighted by multiple victories in the cross country season and several PRs in the marathon. The women kicked off the season with several cross country races in San Diego. The first race of the Dirt Dog USATF San Diego Cross Country Series was the Wild Duck 5K, where 11 women toed the line between the Masters and Open races. In the Masters race, Hilary Corno won for the women, leading Darcy Davidson and Maureen Friend to their first Masters Team win. A strong pack highlighted the women’s Open race, led by Kristin Schleicher. Kristin, along with Cortney Berling, Sabina Piras, and Angela Moll, swept the top four places for a perfect score and the first cross country win of the season. All four of the Masters women (Hilary, Darcy, Maureen, and Tracy Wright) showed up for the Crazy 8s 5K in Rancho Bernardo, and swept the field, finishing 1-4 in the Masters Division. This gave them their second team win of the season. The women finished off the regular Dirt Dog cross country season at the Cuyamaca 6K, with full scoring squads on both the Open and Masters women’s teams, for a total of ten women competing. Darcy led the Masters team to their fourth victory of the regular season, whileCortney led a strong pack of Open PRT women to their third victory. Both teams would enter the final championship race undefeated when they had a scoring squad on the line. The Championship race was held at Mission Bay on a bright, crisp morning in early November. Ten women would again toe the line with both individual and team standings to be defended. A strong pack of women came through the first loop, where PRT’s pack mentality worked to its advantage. The women of PRT pushed the pace through the next two loops, pulling away from the field to place first through fifth in the race. Cortney kicked it to the finish line to be the overall victor, followed by Erin Menefee (note: Erin did not score for PRT as she was not enrolled on the team at the beginning of the season, but we are excited to see her rock it next season! ), Julie Sawyer, Noelle Rysselberghe, and Hilary Corno, the overall Masters Women’s champion. Sabina Piras rounded out the scoring team for the Open women, finishing in eighth. Overall, PRT women accounted for eight of the top ten finishers in the Championship race, with the top four women finishing within eight seconds of each other! On the Masters side, after Hilary, Darcy finished second and Maureen finished fifth. Strong performances from both the Open and Masters women allowed PRT to clinch both titles for the overall Dirt Dog Series. This was exciting both because it was the fourth year in a row for the Open women to win, and because the Masters Women’s win marks the first year that PRT fielded a team in that division. For the individual standings for the season, PRT took six of the top ten spots, led by Cortney (1st). She was followed by Julie (2nd), Sabina (3rd), Noelle (6th), Kathy Dunbar (7th), and Sara Sanchez (10th). Similar to the results of the Championship race itself, Hilary was the overall champ of the Masters Series, followed by Darcy (2nd) and Maureen (5th). After a strong showing locally, the women of PRT were ready to head up to the USATF Club Cross Country National Championships in San Francisco. There a squad of eight Open women raced with some of the top talent in the United States. Three hundred and fifty women representing over 40 teams competed over the 6K course in Golden Gate Park. The race started out quick, with a large pack of FAST women blazing through the first mile. PRT fought for every place in the competitive and crowded race. In only their second showing at this national event, the women of Prado finished in 16th place, with Erin Menefee breaking into the top 100 at 89th place. Overall, the season was a huge success for Prado Racing Team! Whlie most of the focus of the fall was on the cross country season, several women also trained for marathons, bringing PRT four new PRs in the distance. Kicking it off for the long-distance ladies, Marie Schaper took on the Chicago Marathon, running a PR of 2:45, shaving over a minute off her previous best. Not to be outdone, a few weeks later Hilary Corno lined up in the Elite division in the New York City Marathon. She ran a 2:45 as well (only one second faster than Marie ran!) and was the second Masters woman in the race. In the last marathon of Prado’s Fall season, at the California International Marathon, Sabina Piras gunned for an Olympic Trials qualifying time and Julie Sawyer made her marathon debut. Sabina ran a strong 2:43, which in the next few weeks would be announced as a qualifier time, entering her into the Olympic Trials race in Los Angeles. Julie accomplished her goal for her first marathon, finishing in 2:47. To top off an awesome season, PRT's own Maureen Friend was honored on February 28 at the USATF San Diego annual Track Banquet as the 2015 Masters Long Distance Runner of the Year! We are all very excited for and proud of Maureen! The PRT Men made more than 100 race appearances this past fall, consistently bringing scoring teams in both the Open and Masters divisions to the Dirt Dog XC Series races. The Masters team, led by Robert Verhees and Stephen Johnson, won the overall team title, while the Open Men, coming in third in a closely fought championship race with San Diego Track Club and Milestone Track Club, took second in the overall team scoring, and had three men in the top-ten individual scoring (Tyler Underwood, Derek Bradley, and Alex Phipps). Alex Phipps led the Open team at the first race of the series, the Wild Duck 5K, running 16:13. He was closely followed by Dan Seidel (16:14), Thomas Whitcomb (16:15), Chuck McKeown (16:19), and new member Rory Golden (16:51). Stephen Johnson won the Masters race in 16:54, followed by team captain Brian Culley (17:03), Greg McMillan (17:21), Jason Lewis (17:21), and Iron Dog Sean Fader (17:39). Iron Dog Sean Fader at Cougar Challenge 8K. At the very tough Balboa 4-Miler, new member Justin Turner made an immediate impact, finishing just behind Derek Bradley (22:07) in 22:09, followed by Dan Seidel (22:12) and Chuck McKeown (22:50). Rob Verhees took second in the Masters race, and Jeff Creighton, running in the 50+ division, took fifth overall Master. The PRT Open Men won their first team race of the season at the Bonita Stampede (8K), with an outstanding performance by new member Tyler Underwood, who took second overall in 26:25. Seidel, Phipps, Whitcomb, and Bradley all finished within a minute of Tyler to seal the team victory. In early October, PRT had a great turnout at the Balboa Boogie 5K, with all top five Open men (Derek Bradley, Dan Seidel, Eduardo Mariscal, Justin Turner, and Alex Phipps) running well under 16 minutes on the rolling course. For the Masters, Rob Verhees took second in 16:13, followed closely by Stephen Johnson (16:21) in third. Alex Phipps turned in a terrific sub-26-minute performance at the Cougar Challenge 8K to lead the Open team, and Rob Verhees and Stephen Johnson again took second and third, respectively, for the Masters, with additional strong races by Jeff Creighton, Sean Fader, and Joel Bernard, all breaking 30 minutes. Justin Turner and Tyler Underwood at Dirt Dog Champs. Derek Bradley led the Open men to a team win at the Cuyamaca 6K on November 1, taking second overall in 19:19. He was followed by Tyler Underwood, Alex Phipps, Eduardo Mariscal, Daniel Farmer, and Patrick Baldwin. The Masters men swept the top four spots, with Stephen Johnson taking the top spot in 20:35, followed by Jason Lewis, Jeff Creighton, and Sean Fader. After a long season, the Dirt Dog Championship 8K race was held on November 16 on a tough, four-loop grass course at Mission Bay. Justin Turner, who also ran a 2:25 marathon in October, led the Open men in 26:57, and scoring behind him were Tyler Underwood (27:03), Alex Phipps (27:16), Derek Bradley (27:22), and Thomas Whitcomb (27:56). The Open men narrowly took third in the race but earned second place overall in the Dirt Dog series. The Masters men, extending their dominance from earlier in the season, won the race and the series, with Rob Verhees (28:15; 2nd), Stephen Johnson (28:31; 3rd), Jason Lewis (29:46), Jeff Creighton (29:51), and Brian Culley (30:09) making up the top five. In the overall individual standings for the Dirt Dog series, Tyler Underwood took second place, and Derek Bradley and Alex Phipps also finished in the top ten. Stephen Johnson and Rob Verhees took second and third overall, Jeff Creighton was second in the 50+ division, and Sean Fader achieved “Iron Dog” status, running all races in the series. All in all, a great season for the PRT men’s team, and they look forward to another great year in 2015! As always, the team focused on the San Diego Dirt Dog Cross Country series during the fall, competing in a total of eight cross country races spread out over San Diego County. The PRT women had a full scoring squad in seven of the eight races, and went undefeated for the 2014 season. The women showed their strength early in the series at the Balboa 4-miler, where the women were led by Jenna Munguia, who finished second overall in the race. She was followed by teammates Courtney Staruch (3rd), Hilary Corno (4th), Caela Timinsky (5th), and Gina Merchant (8th). For the first time ever, the PRT women had a Masters runner competing in the Dirt Dog Series. Darcy Davidson won the Balboa 4-miler in the Women’s 40+ division, and would remain undefeated in all races that she ran for the season. The strongest regular-season race for the PRT women came in mid-October at the Cougar Challenge. PRT had three runners under 18 minutes on the cross country course, led again by Jenna Munguia, who was first overall in 17:12. She was followed by Courtney Staruch, who set a new 5K PR of 17:21, and Hilary Corno, who ran 17:37. Also finishing for PRT was Gina Merchant (18:17), Angela Moll, who ran 18:32 only six days after competing in the Chicago Marathon, and Julie Sawyer (19:47). The PRT women went into the championship race undefeated, and as the reigning Dirt Dog Champions. The women did not disappoint in an exciting race. Jenna Munguia showed her strength by pulling away from the lead pack early in the race and running all the way to victory. Jenna’s victory in the championship race also sealed her individual champion status in the Dirt Dog Series. She was followed by Cortney Staruch, who ran a gutsy race to hold on to second place. Marie and Hilary finished next, in 4th and 5th, respectively. Darcy Davidson was the fifth PRT woman to cross the line, and the first Masters woman, clinching her Masters individual title. She was followed by Gina Merchant (9th) , Angela Moll (10th), Caela Timinsky (12th), and Sara Sanchez (21st). Overall, the PRT women claimed seven of the top ten spots at the championship race, and seven of the top ten spots for individuals in the series, including the individual champion. As a team, PRT once again repeated as the Women’s Open Champion. In addition to a full cross country schedule, the PRT women were busy racing on the roads and trails during the 2014 Fall season. Both Hilary Corno and Marie Schaper competed in the Long Beach Half Marathon, finishing first and second, respectively, in times of 1:19:35 and 1:20:28. Marie and Hilary after the Long Beach Half. Darcy Davidson ran several trail half marathons and came away with impressive wins in both the Stairway to Heaven Trail Marathon and the Raptor Ridge Trail Half Marathon (where she placed seventh overall – including the men!). PRT had two women PR in the marathon this fall. First, Angela Moll ran the Chicago Marathon in a speedy 2:51:31, good for a new personal record. Then in early December, Hilary Corno tackled the California International and finished with a new PR of 2:47:11. Both ladies significantly reduced their prior times in the marathon. Finally, Darcy and Marie decided to wrap up 2014 with a set of PRs of their own. Both women competed in the Holiday Half Marathon in San Diego and took down the 1:20 barrier! Darcy finished in 1:18:38, followed by Marie in 1:19:43. After a solid season of cross country and road racing, the PRT women gear up for the 2015 spring season, where they’ll focus on several team races in San Diego, as well as participate in events on the track, the trails, and the roads. Check back for more updates and PRs!